Singer Billy ThunderKloud Passed Away on June 5, 2018 From Complications From a Stroke/Pneumonia at His Home in Palm City, FL. Nashville, TN, June 8, 2018	(Newswire.com) - ​​​Born Vincent Clifford on May 7, 1948 in the village of Kispiox in British Columbia and raised in the village of Kitwanga, Billy was a hereditary frog clan chief, belonging to the Gitksan tribe. His Chieftainship name was Chief Dau-Hkansqu. At age 14, he hopped a train from Port Edward, British Columbia to the Indian Residential School in Edmonton, Alberta. As part of a school experiment, Billy was selected from 120 students, along with three other students, to form a musical group. The group was formed to familiarize the non-Indian with the young Indian of today. Billy and the band began touring the U.S. in 1964 as The Chieftones, with Billy (Vince), as the lead singer. In 1965, they released their first two singles “Rang Dang Doo” and “Mona Lisa.” During the next three years, they released five singles for the Claremont, Cuca and Youngstown labels, and were represented by the William Morris Agency. Their song “I Shouldn't Have Did What I Done” is featured on the 2014 compilation album Native North America, Vol. 1. In 1972, Billy adopted the stage name Billy ThunderKloud and the group was billed as Billy ThunderKloud and the Chieftones, signing a recording contract with Superior Records, owned by Duane Allen of the Oak Ridge Boys. Two albums were released on Superior Records. In 1974, Billy signed a recording contract with 20th Century Records and moved to Nashville. Billy and the Chieftones signed with Buddy Lee Attractions in October 1974 for exclusive bookings, and in 1975 added five musicians to the band. After 20th Century closed its record label, Billy signed with Polydor Records. Hit recordings include What Time of Day (20th Century), Pledging My Love (20th Century), Indian Nation (Polydor), Try a Little Tenderness (Polydor), and It’s Alright (Polydor). The single What Time of Day not only reached #16 on the country charts but #32 on the AC charts and #92 on the pop charts. 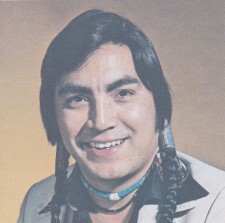 One of Billy’s greatest achievements was when he was chosen Outstanding Indian of the Year in 1975. Billy and the Chieftones performed at President Nixon’s second Inaugural Ball. Billy was a Kentucky Colonel and was also named an honorary Shriner. Billy continued touring until 1991. Billy was retired and living in Palm City, Florida at the time of his death. He’s survived by his wife, Bev, daughters Shawnee (Nick), Chey Kuzma (Sam), and three grandchildren. At Billy’s request, there will not be a service. If you would like, you may make a donation in memory of Billy to National Indian Child Welfare Association, Shriners Hospital for Children, St. Jude’s Children’s Hospital, American Diabetes Association, or a charity of your choice.